In a shockingly short amount of time, the internet has bound people around the world together and torn us apart and changed not just the way we communicate but who we are and who we can be. It has created a new, unprecedented cultural space that we are all a part of—even if we don’t participate, that is how we participate—but by which we’re continually surprised, betrayed, enriched, befuddled. We have churned through platforms and technologies and in turn been churned by them. And yet, the internet is us and always has been. In Lurking, Joanne McNeil digs deep and identifies the primary (if sometimes contradictory) concerns of people online: searching, safety, privacy, identity, community, anonymity, and visibility. She charts what it is that brought people online and what keeps us here even as the social equations of digital life—what we’re made to trade, knowingly or otherwise, for the benefits of the internet—have shifted radically beneath us. She is not interested in the fortunes being made or the specific technologies developed, but in the space we have made and the culture we have created. It is a story we are accustomed to hearing as tales of entrepreneurs and visionaries and dynamic and powerful corporations, but there is a more profound, intimate story that hasn’t yet been told. 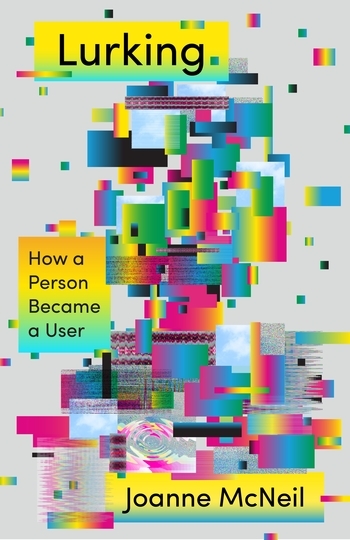 Long one of the most incisive, ferociously intelligent, and widely respected cultural critics online, McNeil here establishes a singular vision of who we are now, tells the stories of how we became us, and helps us start to figure out what we do now. Joanne McNeil is an American writer, editor, and art critic interested in the ways that technology is shaping art, politics, and society. She was a 2015 fellow at the Carl & Marilynn Thoma Art Foundation. She was an artist-in-residence at Eyebeam and the editor of Rhizome at the New Museum from 2011 to 2012, and she edited The Best of Rhizome 2012. She has contributed to Frieze, Los Angeles Times, Wired, and The Boston Globe, among other publications; formerly edited the blog The Tomorrow Museum; and is currently an affiliate at the Berkman Klein Center for Internet & Society.